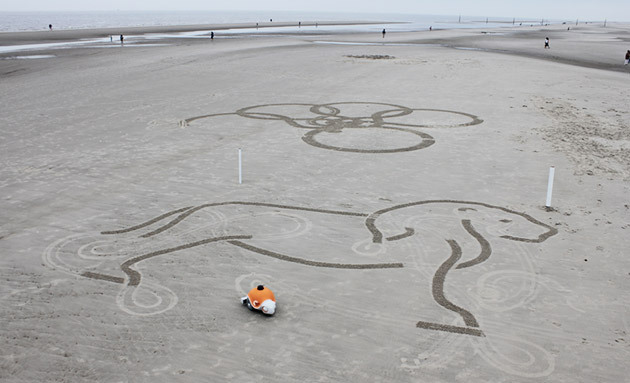 The robotic turtle above can't wield katanas, eat pizza or shout cowabunga, but it can still do something awesome: draw big sand sketches on the beach. It's named "Beachbot" and was developed by a team from ETH Zurich and the Zurich division of Disney Research, a network of labs responsible for some really fun projects in the past year. Beachbot draws on the sand by controlling the pressure it puts on a rake attached to its body: that's the easy part anyway. The real challenge was figuring out how to translate pictures into data the robot can understand, so the team developed algorithms that can turn images into trajectories Beachbot can follow. It's not perfect yet, as they still have to manually tweak the results when working on a particularly big artwork, but they're hoping to make it 100 percent automated in the future. Now, in order for the machine to know where it should draw, the researchers place four poles around a 10 meter x 10 meter area, at most. Beachbot uses the laser scanner on its onboard computer (which is also equipped with WiFi and an inertial measurement unit) to detect those poles and recognize the area as its canvas. It then navigates the canvas with precision using that same laser and IMU. While the machine's already working as planned (as you can see in the video below), its developers hope to move up to drawings so huge, they cover whole shorelines. According to Disney Research Zurich head Paul Beardsley, "The dream is to create huge amazing drawings like the Nazca Lines."